A few years ago my brother introduced me to sea chanteys (or shanties, but I prefer the French spelling because it's a better reflection of the word origin), and ever since I've been trying to convert all my friends. But let's face it, they're not an easy sale, especially if you aren't interested in maritime history and don't appreciate shaky old-man voices or drunken Irishman. But chanteys have an amazing history. They were the pop-music of their time, a period that lasted about 400 years. (Can you imagine anyone on the Billboard Top 100 staying there for hundreds of years? I get sick of most of them after a few days.) Like modern pop music, chanteys were designed to be simple and stick in your head, but that was because most seamen were illiterate. 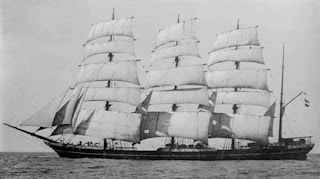 Chanteys gave a rhythm to the backbreaking work of the seamen and perhaps reminded them of the comforts of home as well as the adventures awaiting them in foreign ports. You can even hear echoes of chanteys in both American slave songs and Application music, although it might be more accurate to say you hear echoes of African tribal music in sea chanteys as it's difficult to say which came first and which influenced the other. But that's enough history. On to a new playlist of some of my favorite chanteys. While some of these songs are more technically sea ballads or drinking songs, I wanted to give some variety to make the playlist more listenable as well as give it a modern twist. 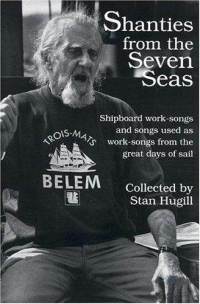 If you want to read more about sea chanteys from the last real sea chanteyman in the world (he died in 1992), Shanties from the Seven Seas by Stan Hugill is a must-read. Or if you're truly adventurous, you can participate in a chantey singalong at the Griswold Inn in Essex, CT, every Monday night starting at 8 p.m.